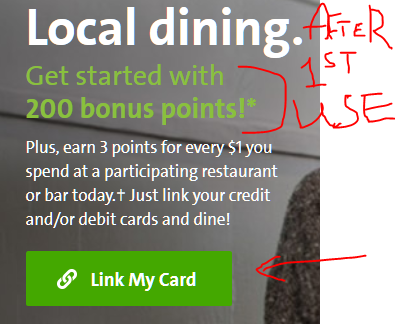 This part is handled by the “Rewards Network” which runs similar dining promotions. If you are not familiar with this, you can just link one credit card and use that to pay any eligible Plenti Dining transactions. You have to give them only your credit card number and zipcode. Nothing else ~ not the expiration date, not the security code. Only some Restaurants are Participating – Check Before Going! If you pay with a credit card that offers restaurants cashback of its own, this should be stackable, since they are paid by two different parties. However, this is only a guess ~ I can’t test this since this program just began! For a limited time, when you visit the Plenti page, you may see a promotion that will get you 200 Points (that’s $2 equivalent) after you make the first qualifying transaction ~ in addition to the standard 3%. So that’s extra motivation to try it at least once. I just signed up for it, as of 5/17/16. I will go to one of the participating restaurants in the next few days and report back. I am not sure how quickly the 3x rewards will show up in the Plenti account, so I don’t know exactly when I’ll post an update.